Mall scavenger hunts make the mall even more fun. When the weather is not great, this activity is the perfect solution to boredom. Whether you use traditional mall scavenger hunt clues for adults, or go wild with fun photo challenges, it’s sure to be a great experience for all. 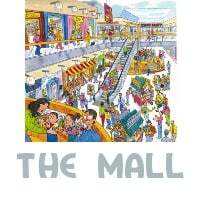 Whatever the weather, whatever the age, a mall really is a great location to enjoy this fun team building activity. When it comes to doing a mall scavenger hunt for adults, the possibilities are endless. Photo scavenger hunts work amazingly well inside of malls, but be certain that photos are allowed within the store you’re going to set the game up in, as some will not permit it. However, you should not let this stop you from putting together your scavenger hunt game, as we are going to be exploring other creative ways that implementing this enjoyable activity inside of malls and many malls do allow photos, so read on to learn more. When in charge of putting together an adult scavenger hunt, often people overlook using the mall as the entire meeting point, which could be causing them to be missing out on a boat load of fun. One such way to set up an adult scavenger hunt could be with using clues, where the person would have to find an object to match the clue given to them, and return with a photo of the answer (preferably with them in it doing something crazy). With this approach, it could be focused by only including certain stores, so that the scavenger hunt clues for adults would be harder to guess at and complete. The entire point is to make the game fun, but challenging enough for the adults taking part to have to do some additional work to discover their next clue, and hard (but not too hard) to complete their answers too. Keep in mind, that for the person in charge of putting the mall scavenger hunt for adults together, they could use a combination of clues, and riddles, and even add dares if they wanted to. Therefore, with this approach they would set up a clue to target a certain food or product located inside of the mall, and ask that a container or wrapper be returned to solve the riddle itself, or add crazy dares to be combined with the objects found. Scavenger hunt clues for adults can be easy, or more challenging, depending on the age group and participants. With that said, when putting the entire mall scavenger game together, the time frame should have a reasonable start and end time associated with it (a bit of pressure makes it fun!). However, before this can be properly determined, the planner should pay close attention to how many items they are going to have on their checklist for the participants to track down and how far apart these items are. Moreover, if the group is not familiar with the mall that will be used, then the invites should be sent out way in advance of the starting date, to allow them enough time to visit the mall and get familiar with it. However, don’t ask your adult game players to do things or solve riddles that would be too obnoxious, as you want to have fun, but you don’t want to be arrested. Yet, they can still be funny things and you can create some amazing videos and photos. In addition, restaurants can help when you’re trying to put together your checklist, as they tend to be more forgiving when adult scavenger hunt clues are silly, like collecting certain items, or asking funny questions even. Putting together extra point items, can make a mall scavenger hunt for adults, more rewarding, so really take the time to think through for this section. In addition, the creator can come up with history questions pertaining to the mall itself, or perhaps how many restaurants that serve certain food items are within the mall. If you’re having troubles with trying to put your own adult scavenger hunt ideas together, you could always check out our scavenger hunt ideas page. Of course, we also provide themed adult mall scavenger hunt packages to select from. We hope our article helped to spark your creative juices to begin flowing for your up-coming mall event.